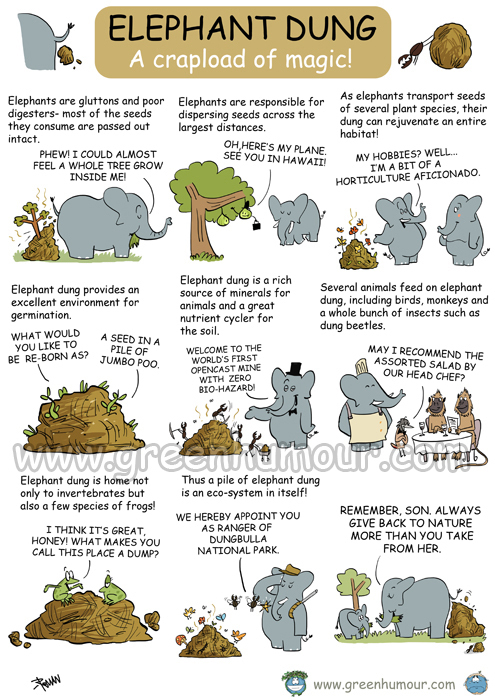 Green Humour: Elephant Dung- a crapload of magic! Elephant Dung- a crapload of magic! A pile of pure magic, a bio-indicator, a microecosystem and an entire wildlife sanctuary- those are just a few tags you can assign to elephant dung! Here's a poster on one of the most accomplished dung balls in the animal kingdom! For international orders, please click here to buy prints from my Redbubble store. Published in the May issue of Saevus magazine. So so funny Rohan! Actually brilliant. Ohhh.. done really really well!! Keep going Rohan..